Motorparks welcomes the all-new SEAT Ateca, the first ever SUV from the popular Spanish car manufacturer. Both powerful and stylish, the New SEAT Ateca is designed to accentuate the sharp lines and curves across the profile, offering a superior demeanour and unparalleled road presence. The Ateca comes equipped with state-of-the-art technology, combining urban performance with city living for a whole new driving experience. The new SUV comes with a choice of powerful TSI petrol and TDI diesel engines ranging from 115 PS to 190 PS, with either front-wheel or all-wheel drive, not to mention manual or dual-clutch DSG transmissions. 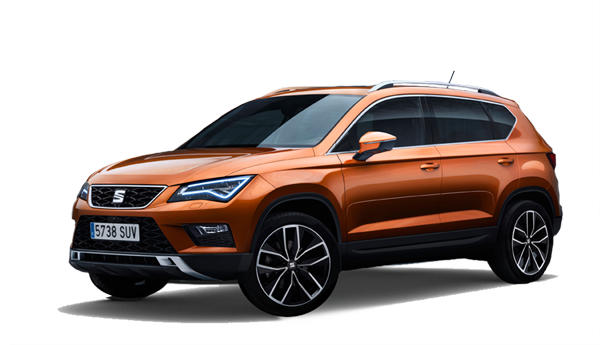 The SEAT Ateca is available in three trim levels – S, SE and XCELLENCE – and will offer colours and specification to suit every taste. SEAT have done something unique and asked you, the public, to vote on the desired features of the all-new SEAT Ateca. The results are reflected in the final specification and designed to fit the needs of your lifestyle. The all-new SEAT Ateca truly is the car decided by the people of the UK. The SEAT Ateca First Edition comes fitted with £3,500 worth of optional equipment at no extra cost. SEAT offers three metallic paint options; Nevada White, Samoa Orange and Rodium Grey all included in the On The Road price. The SEAT Ateca First Edition won't be around for long as SEAT are only building 200 so don't miss out. Enquire on the all-new Ateca here at Swindon SEAT. Motorparks welcomes the all-new SEAT Ateca, the first ever SUV from the popular Spanish car manufacturer. In keeping with SEAT tradition, the Ateca derives its name from a village of the same name which lies to the west of Zaragoza. Both powerful and stylish, the New SEAT Ateca is designed to accentuate the sharp lines and curves across the profile, offering a superior demeanour and unparalleled road presence. The New SEAT Ateca comes equipped with state-of-the-art technology, combining urban performance with city living for a whole new driving experience. The new SUV comes with a choice of powerful TSI petrol and TDI diesel engines ranging from 115 PS to 190 PS, with either front-wheel or all-wheel drive, not to mention manual or dual-clutch DSG transmissions. The SEAT Ateca is available in three trim levels – S, SE and XCELLENCE – and will offer colours and specification to suit every taste. SEAT have done something unique and asked you, the public, to vote on the desired features of the all-new SEAT Ateca. The results are reflected in the final specification and designed to fit the needs of your lifestyle. The all-new SEAT Ateca truly is the car decided by the people of the UK. The SEAT Ateca First Edition comes fitted with £3,500 worth of optional equipment at no extra cost. SEAT offers three metallic paint options; Nevada White, Samoa Orange and Rodium Grey all included in the On The Road price. The SEAT Ateca First Edition won't be around for long as SEAT are only building 200 so don't miss out. Enquire on the all-new Ateca First Edition here at Swindon SEAT.